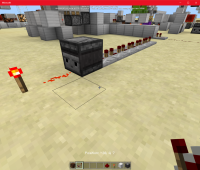 I have an observer block that is observing a piece of powered Redstone. When I reload the world, the observer activates. See image for the contraption I used. The observer does not activate on reloading chunks or if the Redstone is unpowered. Similar to issue MCPE-13608 but unresolved and specific to observers and powered Redstone.